Well, it seems as though Ziggy and the Spiders are fighting again. After nearly two years back together and their first studio album in 25 years Bauhaus have broken up for the third time. With this, Love and Rockets are now playing some of this year’s biggest festivals and Peter Murphy, who’s looking more and more like John Waters as Caligari’s Cesare every day, is bringing his “Retrospective” tour to half-capacity clubs across America. On June 29th Philadelphia’s historic Trocadero Theatre was filled with all the clichés one would expect for Rock’n’Roll’s Gothfather: swooning bois in fishnet shirts, weeping girls clutching tangled crucifixes, and plenty of guys and girls pretending a triple-layered getup of mesh, PVC, and velvet was suitable for a 90-degree day in June (your humble narrator included). Yet there was also an abundance of clichés that would seem more suitable for this summer’s Cruefest: families proudly sporting shorts and flip-flops, twenty-somethings who are about to make manager at their local Hot Topic, and chunky pre-teens in Metallica shirts. Did The Beverly Hillbillies Meet the Munsters ever make it past pre-production? Because if not, this was a first. This change in audience can only mean one thing: Post-punk’s darkest lord has become a nostalgia act. 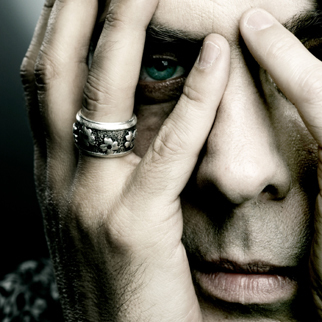 Parents now feel the need to take their children out and introduce them to the music of yesteryear, but has Peter Murphy truly become that inoffensive? Is “Dark Entries” no longer creepy, but catchy? Has “Just for Love” transitioned from haunting to soothing? Apparently so, because on that warm summer night what took place would’ve been more suitable for an All Songs Considered broadcast on NPR than for a late-night spectacle in the ghetto of Gotham City. The performance was indeed a “retrospective” of Mr. Murphy’s career. The set list was an assortment of songs from throughout the artist’s long and evolving career that make little sense when played together. There were the hits (“Cuts You Up,” “Strange Kind of Love,” “The Sweetest Drop,” etc. ), a few fan favorites (“Marlene Dietrich,” “Deep Ocean Vast Sea,” etc. ), a few Bauhaus classics (such a trite move that he’d managed to avoid for so long), and even an only-slightly-too-polished cover of Joy Division’s “Transmission.” At this point in his career, it’s probably just easier to pander to his fans than try to do anything especially interesting.